The Dover Zombie Walk returns on Saturday, Oct. 29, 2011 at 2pm! Zombies should gather in the parking lot of the Greater Dover Chamber of Commerce on Central Ave.; once we’re all ready to shamble, we’ll begin our terrifying march through town and end at Adelle’s Coffeehouse (3 Hale St., across from City Hall), where we’ll have the usual costume contests and Jell-o brain eating competitions! Check out our sweet poster, courtesy of Scotty Arsenaul of Commander Kitty! ~ by doverzombiewalk on October 14, 2011. This entry was posted on October 14, 2011 at 4:11 pm and is filed under meta, zombie art.You can follow any responses to this entry through the RSS 2.0 feed.You can leave a response, or trackback from your own site. 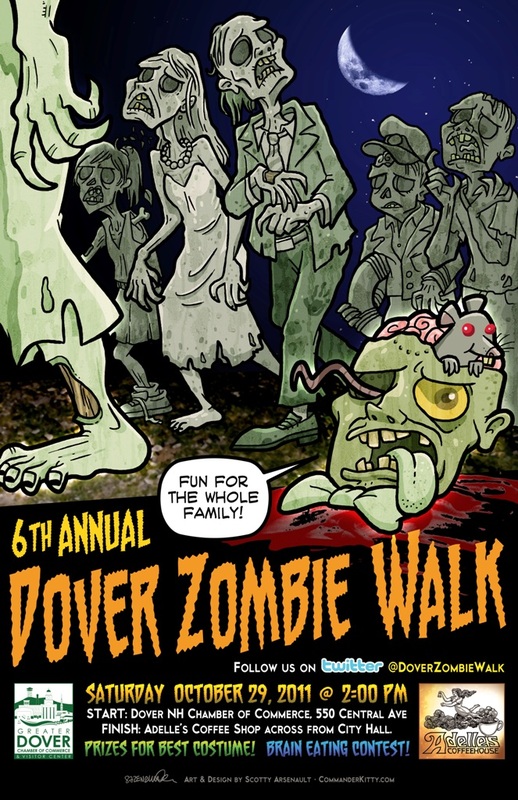 Next: The 8th Annual Dover Zombie Walk: Saturday, Oct. 26 at 2 p.m.